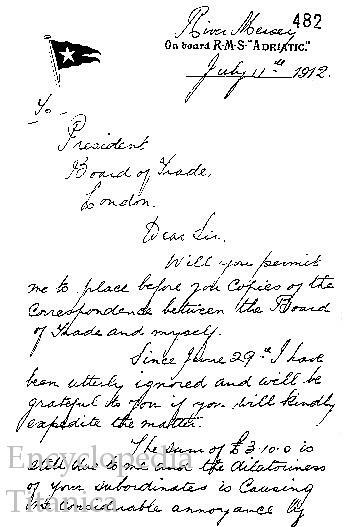 A letter from Titanic Fourth Officer Joseph Boxhall to the President of the Board of Trade, Sydney Buxton, written in July 1912 while Boxhall was serving aboard the Adriatic. Boxhall complained about the fees paid to him for his attendance at the Titanic Inquiry. In a subsequent letter he threatened to refer the matter to the "Merchant Service Guild" if he did not receive satisfaction.